From Dal News (read the full article here). Featuring MLIS student, Tyler Lightfoot. Tyler Lightfoot didn’t plan on becoming a data analyst. A degree in English and Psychology, plus years of working in sales and service, do not necessarily point to a highly technical career. “If you had told me five years ago where I would be today, I probably would have laughed in disbelief,” Tyler says. “But when my current position [Institutional Analyst with Dalhousie Analytics] was posted, it immediately interested me. Growing up in the small town of Melvern Square in the Annapolis Valley, Tyler thought he might become a firefighter, police officer or even a chef like his mother. It turns out that his self-proclaimed “obsession” with reading scientific research journals would become useful. Tyler didn’t plan on graduate studies either. 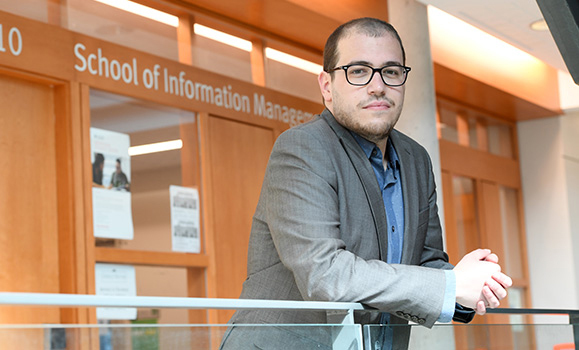 Until a co-worker who had recently graduated from Dalhousie’s Master of Information Management (MIM) program encouraged him to apply, he didn’t believe further education was a possibility for him. He is now completing his second year in the Master of Library and Information Studies (MLIS) program. He has found a way to link his graduate work to his day job. 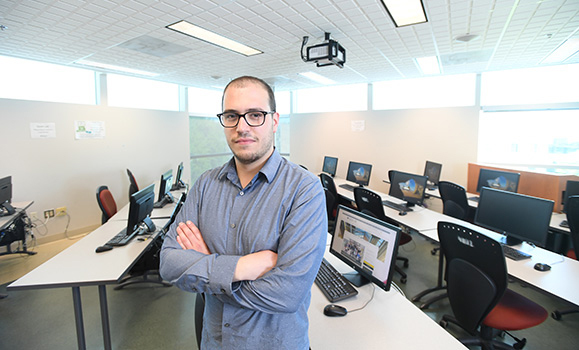 A conversation with SIM professor Lori McCay-Peet gave Tyler the confidence to apply for a research assistant position with the Consumer Trust and Social License project, helmed by Sylvain Charlebois, Vivian Howard, Tony Walker, Peggy Cunningham, Michelle Adams and Jeffrey Friesen. The project attempts to answer if Canadians believe that organizations are trustworthy, socially responsible, environmentally sensitive and ethical. In other words: do Canadian organizations have a “Social License to Operate,” or “SLO”? ? The group recently published the Food Retail Sector Consumer Trust Report. In the meantime, Tyler has also been applying his analytical skills to data collected from the “Impact Together” consultation sessions regarding the strategic direction of research across campus. Not surprisingly, this work fascinates him. Tyler’s journey shows that you should never be afraid to pursue an unfamiliar path or to chase after whatever captivates you.